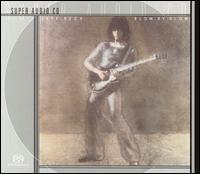 Date of US Release March 1975 Blow by Blow typifies Jeff Beck's wonderfully unpredictable career. Released in 1975, Beck's fifth effort as a leader and first instrumental album was a marked departure from its more rock-based predecessors. Only composer/keyboardist Max Middleton returned from Beck's previous lineups. To Beck's credit, Blow by Blow features a tremendous supporting cast. Middleton's tasteful use of the Fender Rhodes, clavinet, and analog synthesizers leaves a soulful imprint. Drummer Richard Bailey is in equal measure supportive and propulsive as he deftly combines elements of jazz and funk with contemporary mixed meters. Much of the album's success is also attributable to the excellent material, which includes Middleton's two originals and two collaborations with Beck, a clever arrangement of Lennon and McCartney's "She's a Woman," and two originals by Stevie Wonder. George Martin's ingenious production and string arrangements rival his greatest work. Beck's versatile soloing and diverse tones are clearly the album's focus, and he proves to be an adept rhythm player. Blow by Blow is balanced by open-ended jamming and crisp ensemble interaction as it sidesteps the bombast that sank much of the jazz-rock fusion of the period. One of the album's unique qualities is the sense of fun that permeates the performances. On the opening "You Know What I Mean," Beck's stinging, blues-based soloing is full of imaginative shapes and daring leaps. On "Air Blower," elaborate layers of rhythm, duel lead, and solo guitars find their place in the mix. Propelled by the galvanic rhythm section, Beck slashes his way into "Scatterbrain," where a dizzying keyboard and guitar line leads to more energetic soloing from Beck and Middleton. In Stevie Wonder's ballad "Cause We've Ended as Lovers," Beck variously coaxes and unleashes sighs and screams from his guitar in an aching dedication to Roy Buchanan. Middleton's aptly titled "Freeway Jam" best exemplifies the album's loose and fun-loving qualities, with Beck again riding high atop the rhythm section's wave. As with "Scatterbrain," Martin's impeccable string arrangements enhance the subtle harmonic shades of the closing "Diamond Dust." Blow by Blow signaled a new creative peak for Beck, and it proved to be a difficult act to follow. It is a testament to the power of effective collaboration and, given the circumstances, Beck clearly rose to the occasion. In addition to being a personal milestone, Blow by Blow ranks as one of the premiere recordings in the canon of instrumental rock music.